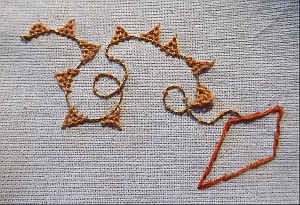 Well, I still haven’t finished the write up of part two of the openwork bookmark project “Glimpse”. However I am now over a dose of depression which made concentrating on everything difficult, and I’m raring to get on with creative stuff again. 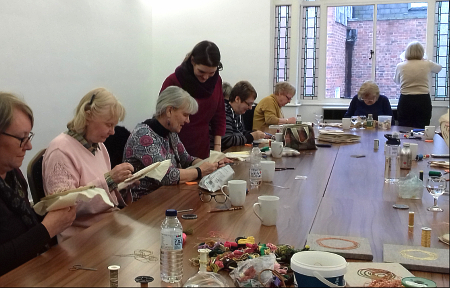 A few weeks ago, Rachel of VirtuoSew Adventures blog told me about the great Lady’s Magazine Stitch-Off – part of a project being run by the University of Kent. The Lady’s Magazine blog put some patterns from the magazine online and invited people to work their own versions. 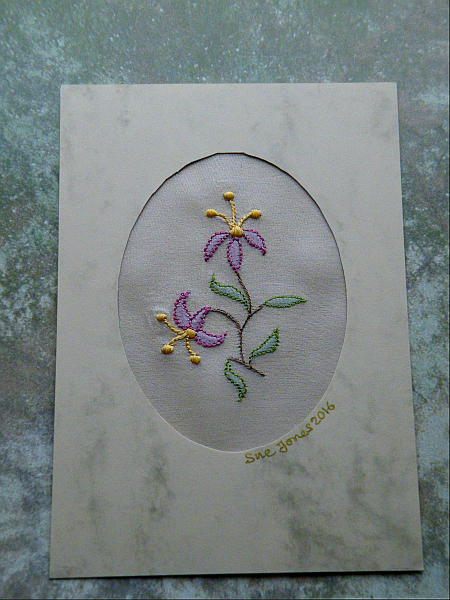 I tried this little sprig in shadow work – Devere Yarn’s 06 silk thread on silk habotai – the fabric was little too light for the stitching but, because of its lightness, it showed the ‘shadow’ colour through well. This year is the 200th anniversary of the publication of Jane Austen’s Emma and the pieces we made are now on show as part of the Emma exhibition at Chawton House. 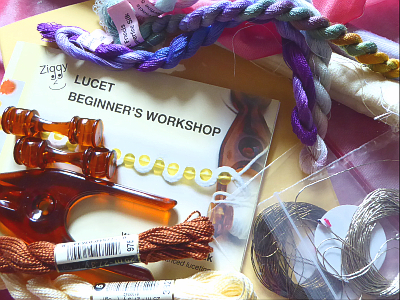 I am all ready for my stitched box workshop in Manchester at Easter, having made up the kits now. (This is part of a science fiction convention in the city.) A workshop is bit daunting as I haven’t run one for very many years. I am sure it will be good fun. It’s the Chester Box pattern which I originally designed for workshopping and for kits. 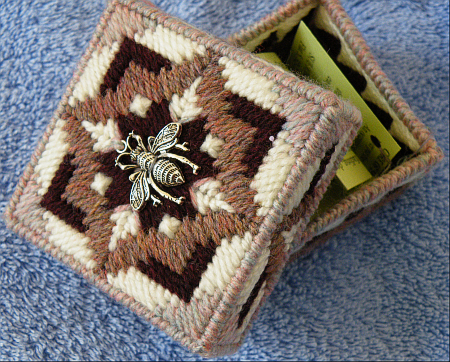 I’ve got some little bee charms to trim the tops of the boxes, in recognition of Manchester: this is a (Man)Chester Box. I’m also exhibiting in the art show there, so I will be as busy as a bee too. 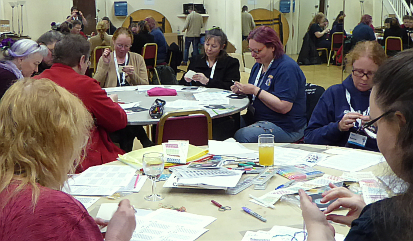 I was a workshop attendee myself, at Shrewsbury Museum and Art Gallery in February – more about this when I’ve finally finished the tent stitch piece that I started there. But my next post will be the second part of the bookmark project, promise! I’ve been staying at my father’s place this weekend. A very pleasant weekend. 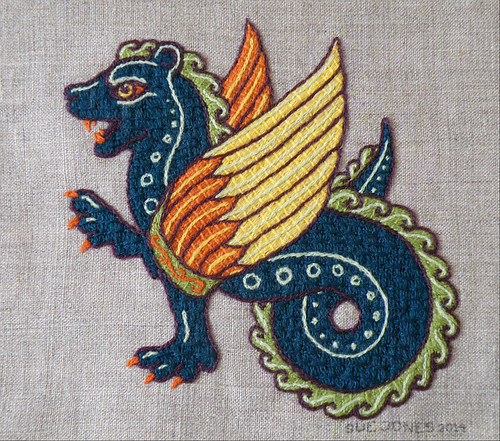 Eating curry, going for walks in the sunshine, doing a few odd jobs and errands for Dad – and putting the last few stitches into the dragon. I’ve made some minor changes to the detail stitching from Tanya’s original design. 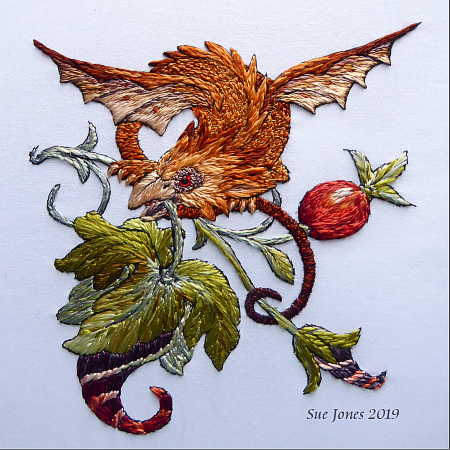 Things that seemed to suit the colours I’d chosen and the personality that my dragon was developing. When a piece of embroidery starts telling me what it wants done, I usually listen. The main change was re-drawing the eye. I’m pretty pleased with the way it came out. I learnt a lot, too. I didn’t really take to split-stitch as a technique, but I was definitely getting much better at it by the end. Last post I mentioned that I’d talk about the materials this time. The fabric is linen or a linen/cotton mixture – there’s a lovely flax smell when you press it, but it is quite soft and not as eager to crease as most linen. It was a tea towel from Shrewsbury market a few months ago. The weave is fairly close: I did a rough thread count and found it about 44 x 38 to the inch. It took the yarn well, without puckering. I used a size 20 chenille needle for all the stitching. The yarn was fine acrylic machine-knitting yarn – two-ply, and very similar in weight to Appleton’s crewel. (As I’ve mentioned before, using wool was out, because of my stupidly sensitive skin.) The story of the yarn started two and a half years ago, when striped scarves were the in thing. The Primrose in Silk has been finished for some time. (This is not a very good photo, but it’s surprisingly hard to photograph – I’ve had several attempts.) 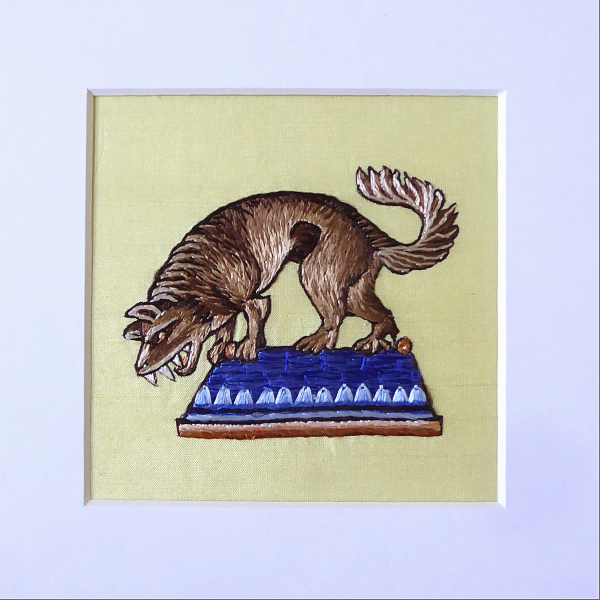 It’s not a flawless piece of embroidery – but I’ve learnt a lot in the stitching of it. I enjoyed the process and I’m quite pleased with the finished result. 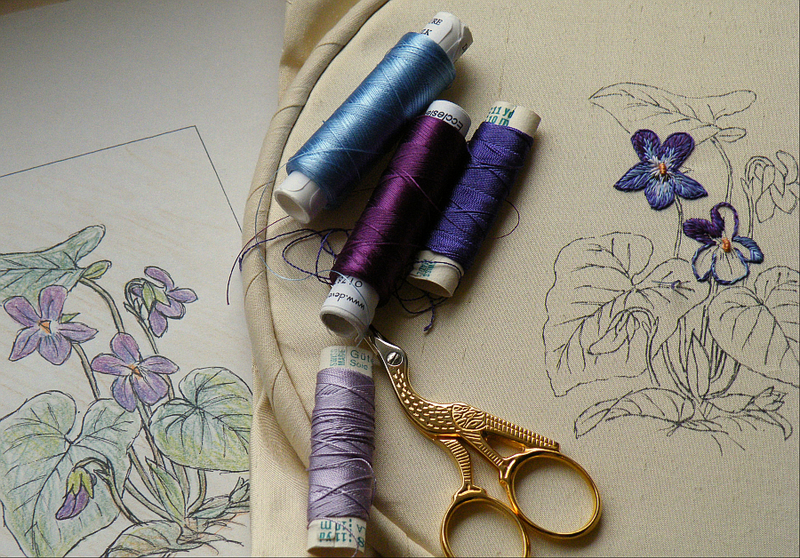 In fact I enjoyed this silk work so much that I have just started a companion piece – with violets. 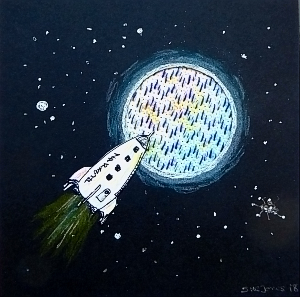 I couldn’t find a suitable design, so I made my own drawing. (It’s largely based on Mabel E Step’s illustration in Wayside and Woodland Blossoms Series I by Edward Step, published in 1905, but I also used photos and other references.) It’s roughly the same size as the primrose and I’m using the same fine silk dupion and fine silk threads from Devere Yarns as well as some very old Gütermann silk buttonhole twist (divided into three strands). I am going to enjoy translating it into stitches. I hope I can make use of all the lessons I learnt from working the primrose, and I hope that I’ll learn some more skills in the process. 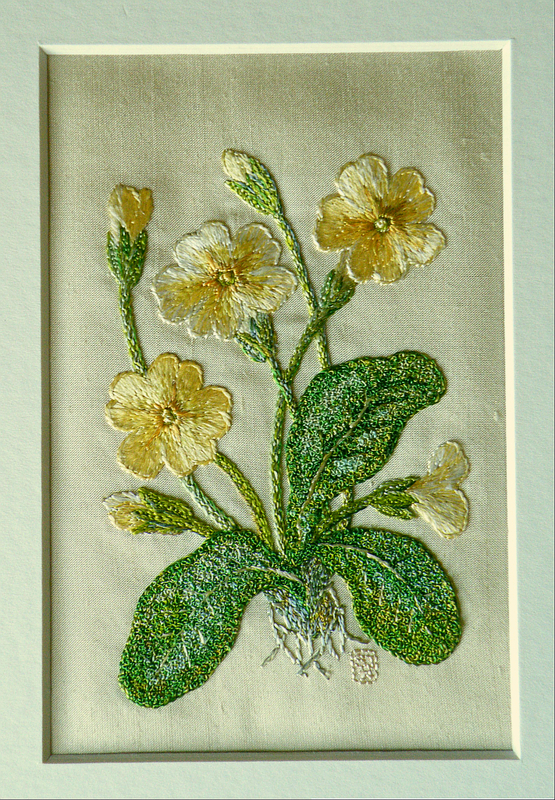 I’ve been asked to list the various stitches used on the primrose, so here goes. 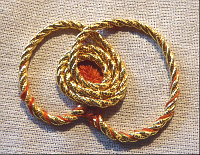 The petals are in long and short stitch with an outline of stem stitch worked afterwards, the flower centre is a coiled bullion knot and the calyx is a mixture of fly stitch and stem stitch. The stems are filled with an under layer of diagonal satin stitches, covered with feather stitch and edged with stem stitch. Rather a long and loose stem stitch makes the midrib and veins of the leaves. The leaves are filled with French knots and outlined with stem stitch. The underside of the leaves and the main root are in chain stitch, with stem stitch again for the small roots. I think that’s all except for various odd stitches here and there to fill in gaps. 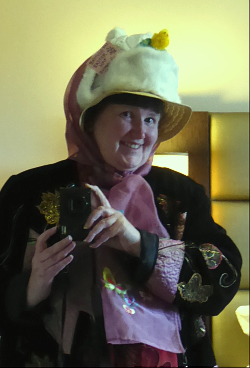 I recently came across author Pauline Fisk’s interesting new blog, My Tonight From Shrewsbury. Pauline is fascinated by the less-known, the hidden and the curious side of Shrewsbury, which she celebrates in words and pictures. As someone who also loves the strange little details of Shrewsbury buildings, this is right up my street. On the 14th of February, Pauline’s blog dealt with the subject of rooftop exploration. And this is something that I feel quite strongly about. Strongly enough to want to talk about it here, at more length than I could do in just a comment on her blog. 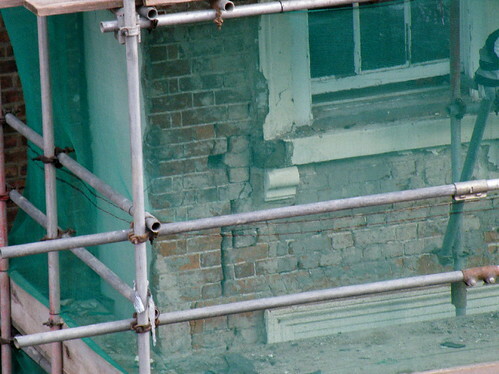 Rather handily, there is a building under renovation a stone’s throw from her street door and from mine. I took a few photos from my living room window this morning, which illustrate one of my main concerns. As the urban explorer Pauline interviewed told her, people don’t often bother to look up at the buildings they pass every day. I have lost count of the people I’ve spoken to who are totally unaware of all the little carved heads flanking the windows and doors of Shrewsbury’s railway station. They are great fun to photograph and use as inspiration for digital artwork. You’ll find a set of them here on Flickr. Also on Flickr is my photo-collection of hopper heads, the decorative tops to rainwater downpipes. Shrewsbury is rich in them – The Square, in particular, has some remarkably fine ones. These are things you can look at without leaving the ground or trespassing. 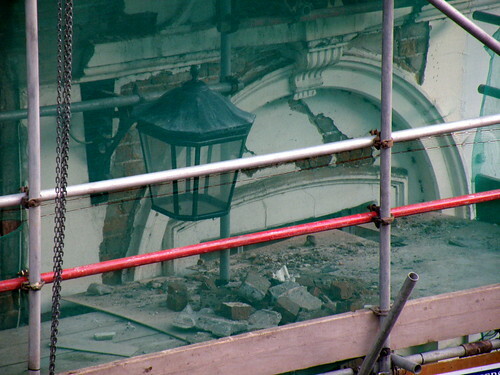 Look at what has been happening under the plaster on this building. 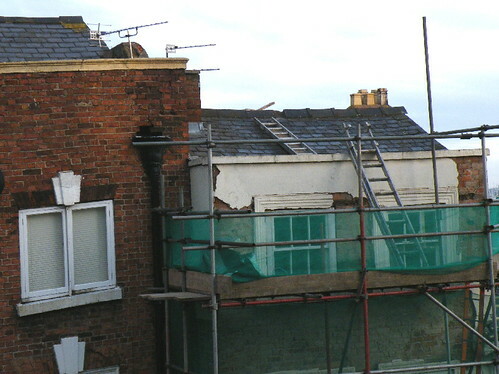 The builders’ netting obscures some of the detail, but you can see the cracks and crumbling wood. 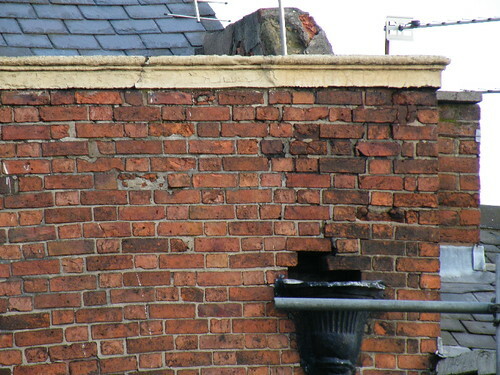 Some urban explorer leans a little too heavily on a parapet, and a chunk of brick or stone drops into the busy street. While I know that the serious Urbexers are never intentionally destructive, our roofs and ledges won’t stand a lot of weight safely. And where the careful ones go, the less careful may follow. Some were on the roof right above my flat a few weeks ago. They may have taken only photographs, but they left three or four cigarette butts on the tiles, and I was quite spooked by the noise they made before I realised what was happening. Across the road, the pinnacles on the Darwin Shopping Centre have been bent and broken; one urbexer grabbed an aerial pole for support on the way back down and the television shop below lost its signal until a repair team could get out to re-align the aerials. Drainpipes are often brittle cast iron, held on with rusting nails. Tiles shift and crack, leading to water ingress and further damage…. Not just the less-careful follow them, either. To glamourise climbing buildings without proper precautions risks attracting those who are too young, too drunk or too thoughtless to be safe at a height. Accepting explorers as a feature of the skyline, also gives cover for those who are ready to be tempted by a skylight or a roof hatch, or simply by the lead on the roof. When I was younger, had I been fitter and possessed of less common sense and a better sense of balance, I might have been tempted to take my own camera up there too. But now I am willing to forgo the grand views. And if I see shadowy figures on the Shrewsbury skyline, my first reaction is to let the police know about it. Not because I want to spoil innocent fun, but because I love our fragile townscape.